“The Darjeeling Limited”, Wes’ newest | Phil-zine! I loved Wes Anderson’s Life Aquatic With Steve Zissou. It was an adventure that a kid might have imagined. What kid doesn’t imagine finding a rare shark at the bottom of the ocean. It was a dream that reminded me of the children’s book Where the Wild Things Are. It’s too bad Spike Jonze is directing it, because Anderson would be the perfect fit. The dry absurdity he bring to his movies sits well with my own personality. 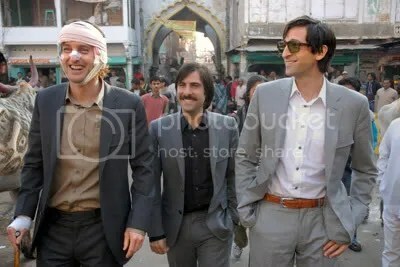 And that sharp humor is put to good use in The Darjeeling Limited, a story about two brothers coerced together by their eldest third to reconnect as family and spiritually on a trip through India. The brothers are played respectively and wonderfully by Owen Wilson, as the eldest who after a near death experience brings them together. The middle child by Adrien Brody, who seems to be most affected by the emotional trauma that split them apart. And the youngest by Jason Schwartzman, a novelist who’s too afraid to admit that his books are based on real events. It’s good that Anderson writes movies about wealthy people, because they can go anywhere they wish at any time they wish allowing for a far more expansive journey. Here though the money isn’t the cause of their inner turmoils. Trouble ensues and the question arises, will they finish their spiritual journey or won’t they? If you’ve seen any of Anderson’s films you’ll be able to guess how it plays out. A friend of mine commented that this film was conventional. Not really, but it follows the ebbs and flows of an Anderson film, and only in that sense is it conventional. That doesn’t mean the journey isn’t fun or moving. Often times it was surprisingly hilarious. The humor doesn’t come from jokes or situations but from the characters and how they react to what’s in front of them at the moment it occurs. Many of these moments came when the characters chose to speak out loud exactly what they were thinking without care as to who was around them. They are some of the most honest moments of the film and made me howl with laughter. I suppose that’s how rich people act. Another thing Anderson doesn’t believe in is conventional camera movement. He uses zooms and whip pans as if they were in style. But he doesn’t just use them, he uses them well. The whip pan is more than just a way to get from one place to another quickly, but to surprise us and catch us off guard. You never know what will be waiting when the camera stops moving. He uses slow motion at three very important moments throughout the film. It also means the actors have to have their timing down, and the three brothers work off each other so very well that editing is most often not necessary. Though the moments that are edited are edited nicely and to great effect. One of these moments leads to my favorite scene in the movie, a flash back that smartly shows us how these characters came to be where they are now and at the same time shows us how they used to be – it’s an immediate, humorous and honest scene. He uses humor and colors to create the whimsy that offsets the more adult moments of the film. Somehow he’s the only filmmaker that can do such a thing and make it work. Those moments of extreme contrast truly catch you off guard because the film looks so breezy. His style has gone beyond a device and has become an artistic expression. Juxtaposing the beauty of the world with the inner turmoil of the characters makes their hopes seem that much more attainable. Everyone in Anderson’s films are worthy of a second chance. This whimsy also exists in the characters and something interesting happens in this film that doesn’t happen to quite full effect in some of his other films. That whimsy is slowly peeled back as their journey falls apart and we get to know these people for who they are. In the end that’s what this is about; like many of Anderson’s films it’s about the bonding of family and people. One of the characters asks, if they knew each other in real life could they still be friends. That’s something I often wonder about my own family. Another question would be, if we weren’t friends in life could we still be family. This ride as these brothers rediscover their family roots is a straight forward joy to watch, but a joy none the less. Straight forward until we witness a surreal tracking shot through the train the brothers started their journey on together, one that reminded me of the side shot of the submarine in The Life Aquatic. It’s the first moment of the film in which we are asked to think outside of the storyline he’s created and see perhaps a larger meaning to it all. If I had one problem with the film it was that it peaked a little too early emotionally for me. After a very climactic sequence another 20 minutes (or so it felt) of the movie remains and it has little else to do but follow itself to it’s own conclusion. The problem is that it follows this path without so much a thought as breaking that convention or surprising us. I could have seen the film end ten minutes earlier than it did, and would have been okay with it. But truly, it’s just extravagant topping on a yummy dessert. This entry was posted on October 8, 2007 at 1:23 am and is filed under Current Movies and Reviews. You can follow any responses to this entry through the RSS 2.0 feed. You can leave a response, or trackback from your own site. Now that I have a 46″ HD TV, i wonder how many films I can skip seeing in the theatre and wait for in-demand. This one is not a must theatre experience. I think you’re safe.